Is Glee (still) a melodrama? A few weeks ago, my TV Theory and Criticism class watched Glee‘s second season premiere alongside two episodes of The Bold and the Beautiful in anticipation of a discussion of soap operas. Instead of drawing comparisons between the two, the contrasts appeared more starkly than I had anticipated. While the soaps made extensive use of dialogue and plot gaps, emphasizing reaction shots to convey emotions and plot progression, Glee seemed to be saying everything. The soap opera may be the example par excellence of television melodrama, but Glee seems to be moving away from the elements of melodrama that made the first season (on a whole) interesting. Religion, like may topics deemed too polemic for broadcast, often goes unsaid, conveyed instead through costuming or set dressing (i.e. a cross necklace or a menorah in the background in a TV apartment). As with melodrama, there exists a “feeling that there is always more to tell than can be said” (Thomas Elsaesser, “Tales of Sound and Fury.”). If melodrama corresponds with “a sublimation of dramatic conflict into decor, color, gesture, and composition of the frame,” as Thomas Elsaesser argues in “Tales of Sound and Fury,” then is Glee (still) a melodrama? Though one episode isn’t really enough to make a case either way, “Grilled Cheesus” is an exemplar of the trend seen thus far in Glee‘s second season: the text is consuming the subtext. In Glee the subtext that would often be sublimated in melodrama often finds expression (though through some displacement still) in the musical sequences. Last season, such sequences were mixed in their presentation: variation between integrated musical numbers (with the characters taking the stage or self-consciously performing the songs) and fantasy sequences (see: “Like A Virgin,” “Keep Me Hanging On”) with many songs sliding between the two modes of address. This season, however, even the fantasy sequences are explained: in the Brittany Spears episode all of the fantasy songs resulted from a dentist’s disbursement of nitrous oxide. And “Grilled Cheesus” is the first fully integrated musical episode of the show, according to Amanda Ann Klein at Antenna. Glee is clearly moving away from the sublimation of action or emotion into fantasy song sequences. Something is lost in the movement away from melodrama’s mode of expression, but in the instance of “Grilled Cheesus” and its primary subject matter: religion and atheism, perhaps it was necessary. The episode pushed at the boundaries of explicit religion and–more uniquely–explicit atheism presented earnestly on television. Kurt, as the voice of atheism for the show, needs to be explicit and steadfast in his non-belief to provide balance with the explicit beliefs of his Christian and Jewish peers. Glee has always been somewhat socially didactic, calling for tolerance explicitly and implicitly, but “Grilled Cheesus” foregrounded that strain to confront the controversial topic of atheism. To a degree, this subject’s avoidance of subtext and sublimation worked. Most clearly, it worked when it was exploring the limits of how people offer comfort. Mercedes, Rachel, Quinn, and Finn cannot conceptualize offerings of comfort outside of their religions. Mercedes, as Kurt’s closest friend, has the most trouble. 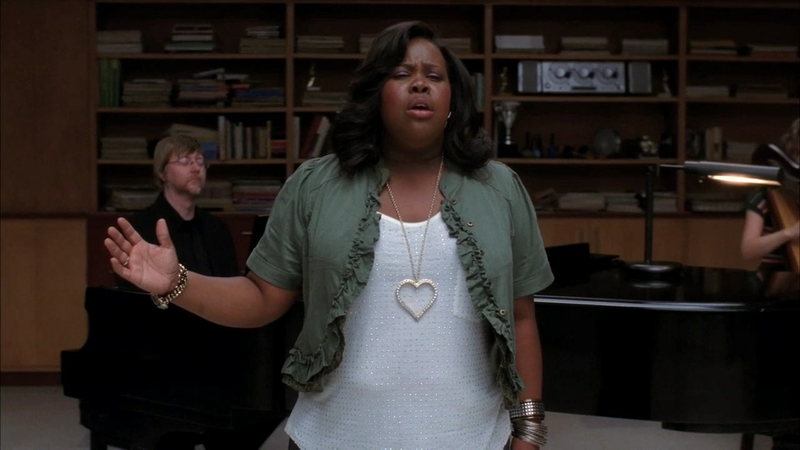 First, she sings “I Look To You,” saying that it’s about looking to God in times of darkness, and even tells Kurt after he rebuffs her attempt at religious comfort, “I feel like I don’t know how to be around you anymore.” Mercedes connects with Kurt on many levels of friendship and understanding, but she never really sees how Kurt can find any comfort outside of God and religion. Kurt’s continued resistance to religious forms of comfort and Mercedes repeated explicitly religious attempts would not work a well as they do in creating tension if one or both were sublimated. However, the erosion of subtext on Glee also makes the show less engaging for me as an active viewer. I find less gaps in both narrative and character development to fill with my imagination or interpretation. Like the choice of “Losing My Religion” and “One of Us,” the episode seemed much more literal than figurative, flattening out the story, songs, and characters. I don’t know if Glee will continue to eat its own subtext or if, as is its wont, it will be consistent in its inconsistency, but I want to close with a comparison of one of the last scenes of “Grilled Cheesus” with one of the last scenes of Supernatural‘s “Swan Song.” In both scenes, a two-person family unit is brought back from the brink by the phrase, “I’m right here; I’m not going anywhere/going to leave you.” Kurt tells his comatose father, Burt, this after saying that he loves him and that he believes in him. In Supernatural, however, Dean tells this to his Lucifer-possessed brother, Sam, without saying anything else. The phrase is not the punctuation to a sentiment; it is imbued with the sentiment through the sublimation of brotherly love into banal expression, presence, and most importantly an object, the family Impala. Both scenes argue for humanism if not over then before religion, yet it is the horror show that expresses it through the melodramatic mode, not the supposed melodrama, Glee. This entry was posted in Uncategorized and tagged atheism, explicit religion, glee, melodrama, religion, supernatural. Bookmark the permalink. As always, interesting thoughts, Charlotte. Narratively speaking, the show, for me, is still a pretty solid melodrama: relationship struggles and triangles, heightened emotions, stock characters, and the occasional deus ex machina (Easy adoptions for the win!). But your idea of text and subtext tension/slippage (can it be both? is that okay?) is what interests me. You use Elsaesser’s definitions and, certainly, Glee moves in and out of the melodramatic M-E-S that Elsaesser outlines. But what about the basic definition of melodrama: music-drama? The show is still about eliciting emotion, heightened with music. But instead of the swelling music right as Kurt’s tears swell up, we get him singing instead (and if his cover of “I Want to Hold Your Hand” doesn’t make you at least a little bit misty, you’ve no soul). Like older forms of the genre (or mode or address, however you want to slice it; I think you use mode), Glee still embraces the musical roots that melodrama grew from. And if we cap it off with the notion that the musical numbers themselves are spectacles, a trait that melodrama relied on for centuries, (we moved from battles on stage to women sobbing uncontrollably to JackFace), you still have melodrama. I guess, still though, you’re right in the sense that Glee brings the subtext to text by singing its music instead of playing it over a scene, as would traditionally be done. I’d argue, however, this only heightens the necessary emotions since the characters are tapped into the scene, aware of the music, making it (still) a melodrama. Thanks for your thoughts, Noel! Melodrama is such a catch-all in some respects. If it’s a mode, it could be the foundational mode of television, and if it’s a genre, it’s so mixed with other genres that it’s difficult to differentiate. Yes, I’m speaking more of melodrama in a mode linked specifically to Elsaesser’s somewhat Freudian conception of melodrama. Looking at function and purpose, I see melodrama linked with the idea that there are some things taboo to talk about but that still need to be expressed. Thus, my focus on the sublimation into mise-en-scene and subtext. I agree about your points about the music and heightening the emotions, but this season, the music seems much more literal than in the past (or just ratio of literal:figurative is more skewed than in the past because Glee‘s song selections have never strayed far from literal). But if we look at “I Want to Hold Your Hand”–and yes, it was emotionally potent–but the story, and Kurt’s interpretation of the song were prologue to the song, leaving little room for interpretation. Maybe I’ve just reached the limit of dismissing moments like this in favor of remembering the big payoffs, but I don’t remember Glee telling me, a viewer, as explicitly and often what each song is meant to convey. Right, right. From your use then, yes, absolutely, I think you’re on the ball. As you say, melodrama’s such a slippery term, that it can be tricky to find the common ground between uses, and even those different uses end up applying different perspectives on the same text (as our exchange showcases).